Financial markets were supposed to know better. They were supposed to be near-perfect processors of information and assessors of risk. They were supposed to be steering us toward a more prosperous, less economically volatile future. Then they failed, spectacularly. 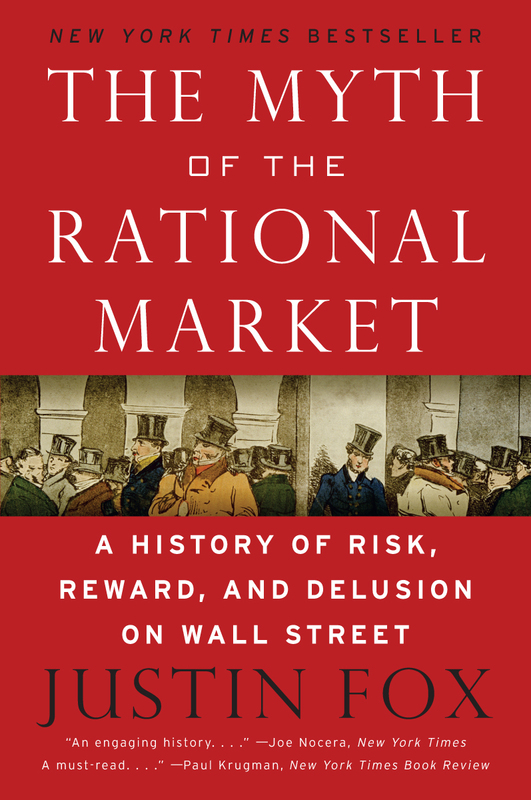 The Myth of the Rational Market tells the story of how we came to believe that financial markets knew best, and how that belief steered us wrong. At least, that’s one way to describe it — I came up with that paragraph as the book was being published in the scary economic environment of June 2009. I had actually started work on Myth many years before the financial crisis, with no axe to grind or presentiments of doom. The inspiration was a book by Caltech finance scholar Peter Bossaerts that I encountered in 2002 in a stack of new releases at Fortune magazine, where I then worked.I couldn’t penetrate much of Bossaerts’ equation-filled argument, but in the introduction he seemed to be saying, in calm, non-argumentative tones, that the efficient market hypothesis’s day had passed. That was news to me. As a journalist who often wrote about the interactions between corporations and the stock market, I assumed that the academic consensus was still that financial markets got things right, could see through the transparent attempts by executives to make their companies’ earnings look better, and were almost impossible for even the most brilliant professional investors to outsmart — which together amounts to a loose definition of the efficient market hypothesis. A bit of digging, though, revealed that the first part, about financial markets getting things right, had been largely abandoned, and the others were under fire. I had already known about Robert Shiller’s claims of “irrational exuberance” in the stock market. What I hadn’t realized was how much work by young scholars critical of the efficient markets mindset was being published in academic finance and economics journals — or that the tech-stock bubble of 1999 and 2000 had truly shaken the beliefs of some of the field’s old guard. Then the Nobel committee went and awarded half the 2002 economics prize to psychologist Daniel Kahneman, whose studies of real-world decision-making had brought into question the simple models of rational behavior that had underpinned post-World War II economics and finance. So I set out to write an article for Fortune, which ended up being based mainly on interviews with Shiller, efficient-markets stalwart Eugene Fama, Kahneman collaborator Richard Thaler, and William Sharpe, who had won a Nobel in 1990 for the capital asset pricing model, a theory of the relationship between risk and return on financial markets that became tightly intertwined with the EMH. I also remember spending a bunch of time talking to Andrei Shleifer, who didn’t make it into the article, and reading and rereading Peter Bernstein’s Capital Ideas: The Improbable Origins of Modern Wall Street, a wonderful narrative of the rise of the EMH, CAPM, and several related concepts. The article was published in Fortune’s annual Investor Guide in December 2002. The headline sums it up pretty well: “Is the Market Rational? No, Say the Experts. But Neither Are You — So Don’t Go Thinking You Can Outsmart It.” In those pre-social-media days, it was hard to tell if it made much of an impression. But I did get a lunch invitation from a book editor at HarperCollins, who told me I should expand the article into a book, and that he would like to publish it. He also told me to go find an agent. Nobody had ever said things like that to me before, so I complied with alacrity (it’s pretty easy to get an agent when you already have a publisher committed to buying your book), and a few months later I had a book contract with HarperCollins. Oh, and before then I took Peter Bernstein and his wife, Barbara, to lunch ask for their blessing — since the book would be a follow-up and partial refutation of Capital Ideas. I got not only that blessing but substantial help from Peter in crafting my book proposal. The man was (he died in 2009) a mensch, as well as an inspiration. The contract said I was supposed to finish the book in 2004. I had no idea if that was realistic, but I figured book publishers didn’t really care about deadlines, right? So I started learning all I could about Irving Fisher, Holbrook Working, Ed Thorp, Jack Bogle, and many others, often got stuck on the theories I was trying to understand and lost in the stories I was researching and … finally turned in a complete manuscript sometime in the first half of 2008. By then I’d been forced to accept a reduced advance and was on my fourth editor (the other three had all left HarperCollins). But my timing of course turned out to be unintentionally brilliant. I finished dealing with my editor’s suggestions just as the financial world was collapsing that autumn, and was able to write my introduction after Alan Greenspan’s famous my-model-of-the-world-was-wrong testimony to Congress in October 2008. So when Myth hit Amazon and a bunch of Barnes and Nobles on June 9, 2009 (the now-defunct Borders didn’t stock it at first, and hardly any independent sellers did either), it seemed extremely timely. This led to the book getting lots more attention, and selling lots more copies, than would have happened otherwise. Links to the reviews are below, and I’ll just go ahead and link to the Daily Show appearance right here. Myth made brief appearances on the Wall Street Journal business bestseller list and the New York Times “extended” nonfiction list (that is, the list, published only online, of the books in 16th through 25th place). It also spent a few heady days jostling with Pride and Prejudice and Zombies and even Twilight in the upper reaches of Amazon’s bestseller list. But while Myth was lucky enough to be a book of the moment for a few months in 2009, it was never intended to be a book of the moment. I embarked on the project because I thought it there was interesting and important story to tell about the rise and partial fall of a set of financial theories that had a big influence on the world, and I took six years to finish because I wanted to research it well enough and tell it well enough that it would last (well, that and because I’d never written a book before and had no real idea of what it entailed, and was working full-time for all about eight months during those six years). And it has lasted. I set out to write a durable intellectual history — or at least a durable pop-intellectual history — and now that the book can no longer be seen as a timely commentary on a recent financial crisis, I think that is what it has turned out to be. I had to correct a few small errors pointed out by Fama, Thaler, and others as soon as the book came out, and since then I have often had occasion to wonder whether I shouldn’t have made mention of this economist or that paper in the book. But on the whole, the thing has held up really well. So, seriously, if you’ve read all the way to end of this and haven’t read The Myth of the Rational Market, just go buy it right now. The price is not always right and markets can be wrong, Richard Thaler, Financial Times, Aug. 5, 2009. Economist Thaler praises Myth in an essay differentiated the “no free lunch” and “the price is right” versions of the efficient market hypothesis. De mythe van de rationele markt, April 14, 2009. Katrijn de Ronde of Dutch financial website z24 runs through the main arguments of the book. In Dutch. I am currently re-reading your Myth … book again today (January 1, 2016) — after reading it several years back with singular focus only on the history of the BSM formula. I received an MBA in Finance in 1974 at UT Austin, and so consequently at my level — not a whole lot of the whole myth story had yet to jell or to be finished back then. Since then, I have not worked in the finance industry other than being on the periphery of energy deriviatives trading issues at the introductory level starting in 1989 up to today. I just saw the new Movie “The Big Short”, a book I had read when it first came out. I would rate the new movie with a B- for entertainment and a D for pitching the subject matter to the level of an interested but non-finance audience. The world needs another book like your Myth … about the myths of who and what lead to the 2007-2009 financial discombobulation and pit of fraud. I do realize this might be a touchy subject if you are still working in the financial world, but you might consider it when you decide to retire from this game of central importance. Many people like Fox are lost in this idea of rational market behavior. The bulk of these people are generally delusional because they make the fatal common mistake supported by TV and the talking heads of assuming that the markets are always rational. They cannot see that the driving forces behind markets are NEVER the fundamentals because markets always move in ANTICIPATION. The “rumor” never actually needs to become NEWS. Markets move simply on what people believe, nothing more. Yet TV, business news, and the analysis promoters always try to explain market movement and in doing so propagate this idea that the market moves on some rational explanation. They offer that as news to try to explain why something takes place because of some related logical fundamental, furthering this myth that markets are rational when they are not. How many talking heads are now calling for a depression right now because that is all they understand and want to see because the stock indexes are near record highs but trading flat and gold was being called the “pet rock”. To them, their linear world is always irrationally upside-down. Myth is nothing more than a fable linearly built on a myth. So many people are lost in the notion of rational market behavior. The bulk of people are generally delusional for they make the fatal common mistake supported by TV and the talking heads of assuming that the markets are always rational. They cannot see that the driving forces behind markets are NEVER the fundamentals. Markets always move in ANTICIPATION. The “rumor” never actually needs to become NEWS. Markets move simply on what people believe, nothing more. Yet TV, business news, and the analysis promoters always try to explain market movement and in doing so propagate this idea that the market moves on some rational explanation. They offer that as news to try to explain why something takes place because of some related logical fundamental, furthering this myth that markets are rational when they are not. How many are calling for a depression right now because that is all they understand and want to see because the stock indexes were near record highs but trading flat and gold was being called the “pet rock”. To them, their world was upside down.